Def: Macro is a single line abbreviation for groups of instruction. For every occurrence of macro in assembly program, macro processor substitutes the entire block. Macro differ from a subroutine in the sense that macro name leads to expansion while routine name leads to its execution. Thus program size doesn’t change by using Macro while using function we can reduce the size. One or more model statement. Prototype statement declares the name of macro & its parameter. Model statements are statements from which the assembly language is generated. 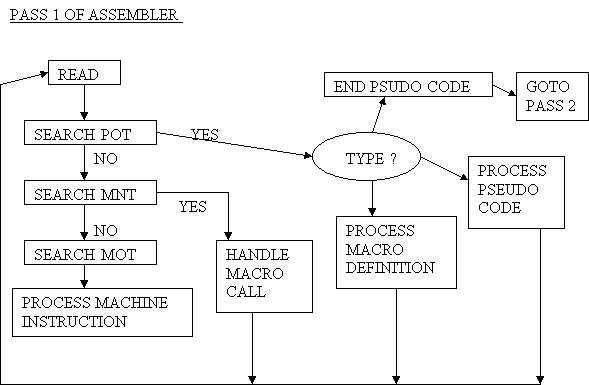 MACRO & MEND are pseudo operation codes of assembly language, and are macro header & macro end statements. A macro call leads to macro expansion. During macro expansion, macro call statement is replaced by a sequence of assembly statements. Two things affect macro expansion. Flow of control during expansion. By default, it is sequential. A preprocessor statement can alter the flow of control in such a way that some model statements are either never visited or visited or repeatedly visited. The flow of control is implemented by using a counter called macro expansion counter (MEC). The name of preprocessor variable which is also preceded by &. POSITIONAL PARAMETER: -In this case arguments are replaced on the basis of their position of the argument list i.e. first actual argument will replace first dummy argument, second will replace the second dummy argument & so on. Macro_name formal parameter name=actual parameter name, formal parameter name = actual parameter name, ……..
Then in call ABC &A=Z, &B=X the default value for &C is used. And in call ABC &A=Z, &B=Y, &C=X the default value Y is overdriven by X. To alter the flow of control. SEQUENCE SYMBOL: It is a variable name preceded by a dot (.). It is also called macro label & do not appear in the output of the macro processor. It is used in AIF or AGO statements designate the destination. AIF is a condition branch statement. The AIF statement has syntax. Where expression can have values EQ for Equal, LT for less than, GT for greater than, and NE for not equal to. If expression evaluates to true then control is transferred at a statement containing sequencing symbol. E.g. Will leads to different expansions. We break the process in 2 passes. In pass I, macro definition is searched and entries are made in appropriate tables. In pass2, macro calls are recognized & expansion is done. Before discussing further, let us understand the limitation of a macro processor. A macro definition refers to nothing outside themselves. Macro calls refer only to macro definition. Macro calls substitutes the text and not values of parameter. 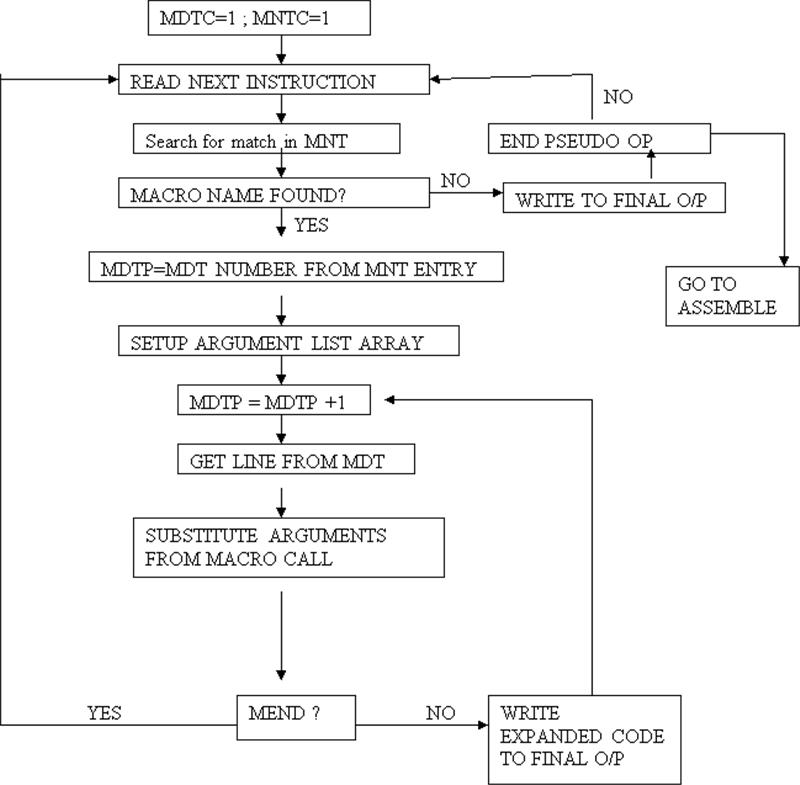 Example: - if in assembly program two lines are situated as follows. Then macro processor substitutes Y & not 10 for the argument in macro definition. This is because macro never processes the EQU statement so it does not know the value of Y. 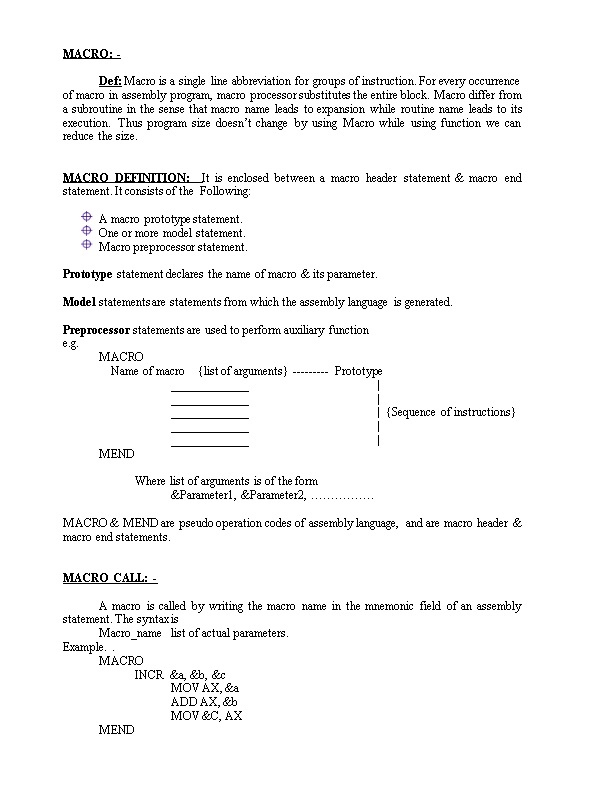 Macro definition table (MDT) used to store the body of macro definition. Macro name table (MNT) used to store the name of definition and entry, which points to corresponding entry in MDT. Macro definition table counter is used to indicate the next available entry (MDTC). Macro name table counter (MNTC) to indicate the next available entry (MNTC). Argument list array (ALA) used to substitute index markers for dummy arguments. Pass 1 tests each I/P line. If it is macro pseudo op code, the entire macro definition is stored in the next available location in macro definition table and macro name is entered in MNT along with pointer to the first location of the MDT entry. When END pseudocode is encountered, control is transferred to pass 2. Given a restriction that all macros must be defined before calling them, we can join 2 passes into a single pass. Here we need another indicator MDI which can have values ‘ON’ or ‘OFF’. 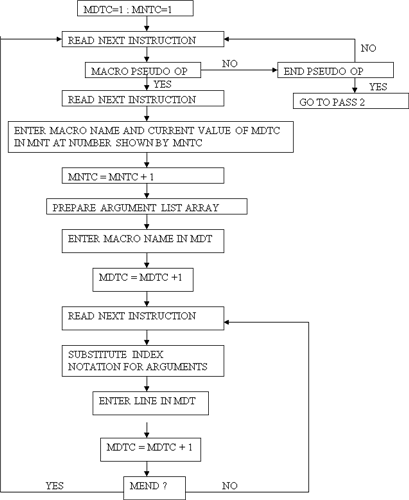 MDI ON means lines are read from macro definition table and OFF means lines are read from regular input stream. As a preprocessor, which make complete pass over the text before pass 1 of assembler. If we create macro processor within assembler some functions can be combined. Database can also be prepared jointly. e.g. MNT can be joined with assembler’s MOT or POT. Similarly the read function that expand macro calls and receive the source I/P will be same. Many functions do not have to implement twice. More flexibility for programmer as he can use all the features of assembler as well as macros. Program may be too large to sit into memory ofM/C.